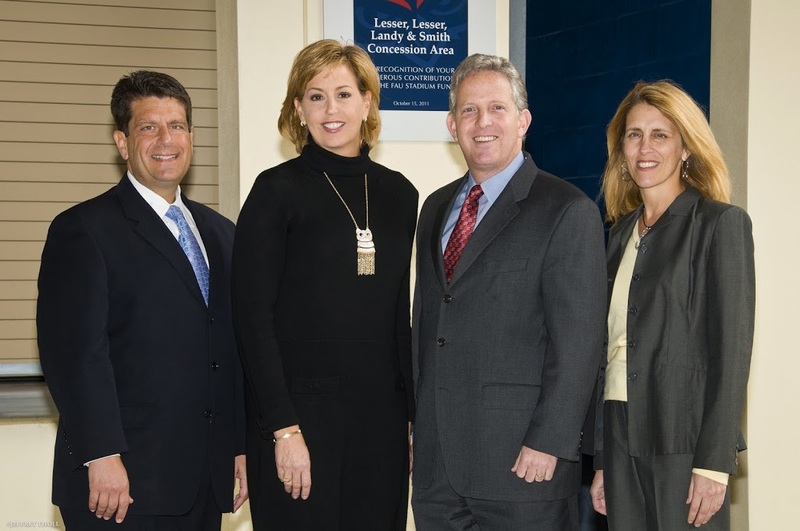 BOCA RATON, FL (February 22, 2012) – The Florida Atlantic University athletics department recently received a gift of $50,000 for its on-campus stadium from Gary Lesser on behalf of Lesser, Lesser, Landy & Smith, PLLC. The contribution has been recognized with permanent signage on a stadium concession area. Gary Lesser is managing partner for Lesser, Lesser, Landy & Smith and serves on the Florida Bar Board of Governors. He also is a member of the FAU Foundation Board, a dedicated group of alumni and friends of the University who volunteer their time and expertise to spearhead fundraising efforts and manage the Foundation’s assets. This year, Lesser and his Firm are celebrating 85 years of serving its clients and supporting the greater community of Palm Beach County. To date, FAU has secured more than 30 named sponsorships for the stadium. The University is offering naming rights for more than 30 additional venues in and around the stadium to help fund the $70 million project. FAU’s 30,000-seat open-air stadium features 6,000 premium seats, including 24 suites, 26 loge boxes, 1,000 premier club seats and 4,000 priority club seats, and the latest, state-of-the-art amenities. For more information about FAU Stadium, visit www.fausports.com. For more information about FAU’s Division of Community Engagement, call 561-297-3575. Photo Caption: From left, Joseph Landy; Jennifer O’Flannery Anderson, Ph.D., vice president of community engagement at FAU; Gary Lesser; and Merryl Haber. Lesser, Lesser, Landy & Smith, PLLC, (LLL&S) the third oldest law firm in Palm Beach County, was established in 1927 by Joseph H. Lesser in West Palm Beach, and is now celebrating 85 years of serving clients throughout Florida, focusing on serious personal injury and wrongful death cases. All Firm partners and associates are “AV” rated by Martindale Hubbell, the highest rating in ethics and legal ability. With offices in Boca Raton, West Palm Beach and Stuart, LLL&S is active in the community, and has donated significant time and financial support to numerous charities. For more information on LLL&S call (561) 655-2028 or visit www.lesserlawfirm.com. Florida Atlantic University, established in 1961, officially opened its doors in 1964 as the fifth public university in Florida. Today, the University serves more than 29,000 undergraduate and graduate students on seven campuses and sites. FAU’s world-class teaching and research faculty serves students through 10 colleges: the Dorothy F. Schmidt College of Arts and Letters, the College of Business, the College for Design and Social Inquiry, the College of Education, the College of Engineering and Computer Science, the Graduate College, the Harriet L. Wilkes Honors College, the Charles E. Schmidt College of Medicine, the Christine E. Lynn College of Nursing and the Charles E. Schmidt College of Science. FAU is ranked as a High Research Activity institution by the Carnegie Foundation for the Advancement of Teaching. For more information, visit www.fau.edu.